The Little Brown Jug softball team has had it's share of disappointments over the last couple years, losing in the Norristown A-Division championship finals two straight years. With a little help from some friends, the team banded together and entered this tournament with no expectations whatsoever. Playing with a relaxed attitude, the JugHeads got through bracket play with a 2-1 record, finishing second to league rival Cannon Roofing. The lost to Cannon in the opening game 20-9, then beat the Crusaders 28-18 and Sidewinders 27-24. In Sunday's Single elimination play they defeated James Moore Painting 13-12, then survived a slugfest with the powerful Jackdaddy's team of Lehigh Valley by gaining a 32-28 victory. In that game Dennis Condomitti of Jackdaddy's hit two home runs that honestly traveled over 400 feet. In the final game against Monte Harris and his Riddlers/Team Dawg squad, the Jugsters emerged with a 27-9 win behind the 5-for-5, 2 HR performance of Tom Pagel to capture the tournament title. The ten players that played all six games batted over .600. It was a total team effort lead by Tournament MVP Bill Gulotta who went 20-for-26 (.769 average) on the weekend. Marty Murray and Jimmy Bailey were on fire the whole weekend as they both went 16-for-22 for a .727 average. The power was supplied by Big Joe McFarland who went 17-24 (.708) with 5 HRs and John Brooks who went 17-25 (.680) also with 5 HRs. The other leading htters were Steve Dimitry (15-22, .682), Steve DiMarino (14-21, .667), Tom Pagel (17-26, .654), Ryan Walker (15-23, .652), Tony Carfagno (15-25, .600). Tom McLaughlin (8-11, .727, 2 HRs) pitched in the Saturday bracket games and Steve Moloney (6-12 with a HR) pitched the elimination games. Defensive wizard Harry Singleton as usual, was the defensive MVP and unsung hero of the Little Brown Jug. Chris 'Opie' Hendricks also filled in were needed as did Dr. Paul Foley, who provided comic relief as only he can. made to the next 5 seeded teams that finished 1-2. All declined to play, so it was decided that the #1 seed would then receive a bye. TNT Sports Club captured the championship in the 11th annual Kim Garvey Memorial Coed Tournament dedicating the tournament to our soldiers in Iraq. TNT wore t-shirts that had soldiers and yellow ribbons printed on them. TNT opened the tourney with the Montgomery County Sheriffs Department. The champs trailed early by the score of 7-0. They exploded for eleven runs in the 3rd inning and never looked back as they went on to win 20-8. In the next game they faced the defending tournament champs Brothers Supply Company (Little Brown Jug in 2002). They rode out the storm to emerge victorious by a 16-11 score. This set up a match-up with Daulton's in the winner's bracket final. The Daulton Gang came back to win 17-13 to send TNT into the loser's bracket where they had a rematch with Brothers Supply. Trailing early, the TNT bats woke up and they topped the plumbers 14-11 to earn a rematch with Daulton's. They had to win twice to gain the crown. That didn't faze manager Sonny Termine and his TNT squad as they won 12-6 in the first game to set up the final showdown. Termine's bombers scored three in the 2nd inning backed by big hits from Chris Molitor, Brenda Ferris, Rob Himes and Shannon Squire. Squire's triple was the big blow in the inning. The Daulton Gang came back thanks to the hitting of Jim Lawler, Heath Hedderick and Keith Berry and the game remained close. Daulton's led by two runs in the 6th inning when TNT stormed back with singles by Patty Sullivan, Joe Termine, Chris Santori and a Grand Slam by Reds Ferris to take a 9-7 lead. The victors added two more runs in the 7th on hits by Molitor, Himes, Squires, Rob Wisner and Sullivan. Daulton's could only answer with two runs in the 7th to fall short 11-9. Tournament Director Jimmy Myers named Shannon Squire of TNT the Female MVP as she led TNT with her great defensive plays in right field and she also batted .600 for the weekend. Other leading hitters for TNT were Himes (.667), Sullivan (.600), Brenda Ferris (.714), Charlie Ferris (.600), Reds Ferris (.778), Pat Ferris (.667), Kelly Ferris (.600), Rich Thomas (.600) and Lisa Myers (.667). Big Joe McFarlane led the team in home runs. Nick Zernone and Mike Lacopolis also chipped in with big hits. Jimmy Lawler was named Male Tournament MVP as he led the Daulton Gang in hitting. Mike Fitzpatrick, Kathy Berry, Jay Scaly, Joe Watson along with the aforementioned Keith Berry and Heath Hedderick also played for Daulton's. Brothers Supply Company (manager-Roger Kummerer) came in third followed by NEA (manager-Tim 'Woodsy' Wilson) in fourth place. Other teams participating in this event were The Montgomery County DA's, West End Beer, Frank's Pub, Whitpain Tavern and Maddy's Bar. All proceeds go the Kim Garvey Scholarship fund in her honor for Kennedy-Kenrick High School. 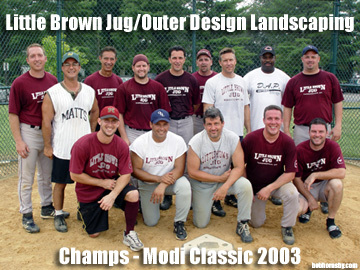 Written by Jug Manager, Tom Pagel - Little Brown Jug / Outer Design Landscaping went 5-1 inroute to the Championship. The Juggies went 4-0 on Saturday and were looking to sweep the tournament until running into a hot hitting Crusader team on Sunday morning that 20 runned the Juggsters to force the "IF" game. But the Jug Boys were not to denied. Led by Tournament MVP Steve Dimitry (18-21 .857), the Juggies tuned the tables and posted a 20 run victory in 4 innings to claim the crown. Also leading the way for the winners where Steve Dimarino (17-20), Calvin Butcher (12-14) and Shawn Remish (15-18). TNT Sports Club scored 114 runs and gave up only 44 runs in their six game march to the ASA of PA Class-A 50 & Over State Championships held once again in Linfield, PA. District-14 commissioner Charles Granese along with Tom Schadt put together a wonderfully run event as usual. TNT Managers Sonny Termine and Butch Fisher put together a fine squad and improved on last year's runner-up finish by defeating Roni's CrackerJacks of Scranton in the final game. Tom Schadt and his Spring Ford AA Red team couldn't defend last year's title as they finished in a third.place. Leading the way for TNT were local legends Al Fiorvanti (17-22, .773), Sam Rosen (16-22, .727, 2 HRs), Jose Castro (16-22, .727) and Sam Boccella (13-15, .867). LINFIELD - There might have been more snow on the roof but there was plenty of fire in the furnace for dozens of area softball players as they competed in the ASA of Pennsylvania 50+ Class A slow-pitch State tournament held in Linfield on Saturday and Sunday. There was a decided local flavor as the TNT Sports Club of Norristown fought their way to a state title. It was the club's seventh state or national title in various age groups. Manager Sonny Termine congratulated his gang of senior citizens for never giving up after losing a heart-stopping, 16-15, battle in the game for the state hardware. "Last year, we were undefeated and breezed through the winners' bracket only to lose twice in the finals," he recalled. "We may have choked a bit last year but there was no way our men were about to let it happen again even after losing that one-run game to Roni's CrackerJack of Wilkes-Barre." "We came out in the 'if needed' contest by scoring six runs in the first inning and never looked back," he summarized. 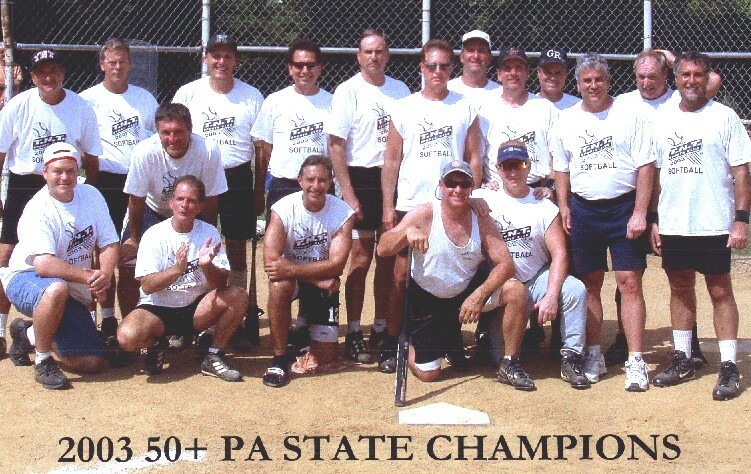 The result was a 14-8 triumph over a red-hot Wilkes-Barre club and an invitation to the Men's 2003 Senior Softball National Championships held in Auburndale, Florida, August 29 through September 1. TNT scored 114 runs in their six games while surrendering but 44. The average margin of victory was 19-7. They boasted a team batting average of .771 led by shortstop Sam Boccella .867. Local heroes who helped the trophy chase included Al Fiorivanti .773, Sam Rosen .727, Jose Castro .727 and Randy Clouser .700. Rosen had the unusual record of hitting two inside the park homers during the tournament. Bob Searles hurled all six games for the champs. "Many of our senior traveling teams play with the younger guys in local leagues," Termine noted. Spring-Ford AA hosted the event but were denied repeating their 2002 championship by the two talented clubs that met for the title. The hosts entered two squads in the tournament. The CrackerJacks of Wilkes-Barre built a formidable road block by defeating S-F Red, 12-7, in Saturday competition to send the defending champs into the losers' bracket. They met again in the bracket finals on Sunday noon but fell 17-3. "We just didn't hit all weekend," pitcher/coach Tom Schadt complained. "It was a 4-3 game until the fifth when they scored 12 runs in the inning." Obviously the Wilkes-Barre Club found the CrackerJack prize as they stayed hot for their next game. Senior softball is not a wheelchair game by any means. Fans were impressed by the caliber of play. The Fifty's might be a step slower but they make up for their age with years of experience. Strong arms still throw to the right bases while defensive gems were part of every contest. Each team had infielders who could cover the ground and make accurate throws. What the outfielders lacked in former speed they adjusted by playing the hitters with intelligence. There were several interesting rules for senior softball. For example, there are two home plates about eight feet apart plus a no return line 20-feet down the foul line. Once a player crosses that line he may not return to third but heads for the alternate home plate. The catcher acts like a first-baseman on a play at home. If the throw beats the runner who heads for the alternate plate he is out. There is also two first bases side by side. Both rules are to avoid contact on close plays. The rules make sense for all ages because younger men and women bend and break in collisions as well. Most have to go to work tomorrow. Other teams entered include: Unity Bank (NJ), A&G (NJ), Sports Page (NJ), Opdyke Lumber (NJ), C.O.D., Kickers Pub and Ready Willing & Abel. The Millennium League "B" vs."C" Division All-Star Game took place yesterday (July 6th) at Marcus Hook Memorial Field, which was preceded by a Home Run Contest, with all proceeds from the events going to the 20th Anniversary Daily Times/Exelon Champs 'n' Charity Classic and their fundraising efforts for the American Cancer Society. Home Run Derby: The Home Run Contest had twenty-one participants enter. After the first round was completed, four players had advanced to the second round where each was given five swings. Pete Mahoric (Tom n Jerry's Rebels) went first and was followed by Scott Keller (Tom n Jerry's Hitmen) Joe Dean (Tom n Jerry's Rebels) and Dan Williams (Clarkie's Goal Post). Only Mahoric and Keller were left standing, both hitting one home run to force another round. This time each was given three swings. Neither was able to launch a ball over the 300 ft. fence at Marcus Hook Memorial Field, but Keller twice hit the top of the fence in left-center field. Each player had one swing in the fourth round to win the contest, but it wasn't to be. The were going to entertain the fans some more by forcing a fifth round, with both once again getting five swings. This time Mahoric lifted one out and waited to see if he would be the champion. Keller made a valiant effort, again hitting two balls off the fence. But it was to be Pete Mahoric's day as he was crowned the 2003 Millennium "B" and "C" Division Home Run Contest Champion. All Star Game: The game, which featured the Millenniun League "B" vs. "C" Division All-Stars, was well played and alot of fun to watch as both teams and their fans which numbered over one hundred in attendance, really got into supporting their teams. The Millennium League "C" Division came away with a 12-10 victory over the "B" Division. Rob Lambie from Casey's Saloon led the way for the "C" Division and was named Most Valuable Player. He had two hits and scored the go ahead run in the fifth inning, while pitching three shutout innings. Other players who contributed to the win were. Dan Hess (O�Flaghertys Sports Pub) three hits, two runs scored and a RBI. Mike Holland (All-Pro Chiropractic) two hits, one run scored and a RBI. Mike McCarthy (Ford Property Maintenance) two hits, two runs and two RBI's. Chuck Kold (All-Pro Chiropractic) two hits, one run and a RBI. Steve Welk (Clarkie's Goal Post) two hits, two runs and two RBI's. The "B" Division Most Valuable Player was Andy Ruhf from Tom n Jerry�s II, who had three hits, including a double and three RBI's. Phil McGee (Tom n Jerry's Hitmen) three hits and a RBI. J.T. Boyer (Flashback Cafe) three hits, triple and two RBI's. Mike Disney (Tom n Jerry's Hitmen) two hits and two runs scored. The Managers, Steve Byrne from the Mudsharks ("B" Division) and Dennis Ellixson from O�Flaghertys Sports Pub ("C" Division) deserve alot of credit for the way they handled their rosters, by getting over thirty-five All-Stars in and out of the game. After the games the teams went to Tom n Jerry's Sports Pub where they were treated to a free buffet and beverages, thanks to the generosity of owners Jerry and Nerissa Burns. When it came time to draw the winners of the raffle, which also benefited the American Cancer Society, the players and fans from the Untouchables team who bought tickets couldn't be touched, winning three prizes including the top two, a DeMarini Softball Bat and (2) Field Box Seat Tickets, Section 238, Row 8 to the Phillies game vs. the Los Angeles Dodgers on July 30th. The Millennium League "B" vs."C" Division All-Star Game and Home Run Contest raised a total of $525.00. Once again the Millennium Sunday League has done a great job in kick-starting the fundraising for the American Cancer Society and the 20th Anniversary Daily Times/Exelon Champs 'n' Charity Classic. Thank you. More info coming on the finish of the following teams: Lenni AC, Haverdogs, Kirby's, Dave's Tavern, Yunkers, Seamus Mulligan's, Spingler's and Romansky's. Swedeland Fire Company, managed by Terry O'Donnell withstood a gallant effort by Mike "Modi" Amodei and his Great American Pub teammates to capture their second consecutive Class-D Qualifier (they won the District-6 National Qualifier last year in Marcus Hook). Swedeland Fire Company (alias Ed Gear and The O'Donnell Family) looked strong from the get go. They defeated French Quarter Bistro by forfeit and then proceeded to roll over Falcones's Sports Cafe, Main Street Pizza and Norristown Rec to reach the finals. Great American Pub (GAP) took the long road to the finals. Modi, Mark Clayton and the GAP boys defeated the Players Club and Maro & Maro in their first two games before losing to Chaz Davitas, Rich Luce, Steve Kalback, AJ Neve, Billy Bradbury, Bill Plichta and the Norristown Rec squad in a hard fought game. This dropped GAP in the loser's bracket where they had to defeat Falcone's, Main Street and then gained revenge on Norristown Rec, beating them in the loser's bracket finals to reach the championship finals. GAP beat Swedeland in the first game of the finals before Swedeland finally ended the two-day affair by defeating GAP in the final "if" game and capturing the district title. Swedeland will now advance directly to the state finals in York on July 25-27th weekend. Home Run Derby: When the twenty-five participants who entered the Home Run Contest and over forty All-Stars arrived in Marcus Hook last night, to help kick-start the Delco softball community�s fundraising efforts of the 20th Anniversary Daily Times/Exelon Champs 'n' Charity Classic for the American Cancer Society, they weren�t sure if any of the planned events would even take place. There was another threat of heavy thunderstorms in the area that could wash away all the festivities. But somehow the softball gods have always looked down on charitable softball events that are held at Marcus Hook Memorial Field. The home run contest started right on schedule at 6:30 p.m. with twenty-five contestants each donating a $10 entry fee, to raise a total of $250 for the American Cancer Society. John Brooks, representing both Mel�s Pub/Diamond Star Sports and Clank�s Bar got things started and never looked back, by smashing six home runs on ten swings, with most of them landing majestically in the Alan McIlvain Lumber Yard, well over 330 ft. away. These are the five players who advanced to the second round and their home run totals from the first round. John Brooks (6) � Mel�s Pub/Diamond Star Sports and Clank�s Bar, Rob Amerson (5) � Seamus Mulligan�s Pub, D.J.Lauro (5) � Seamus Mulligan�s Pub, Joe Povenski (5) � Mel�s Pub/Diamond Star Sports, Calvin Butcher (4) � Clank�s Bar. What was said to be one of the better home run contests to be held in recent years, was shaping up to be just that with five ex-champions making it to the second round. But, this was to be John Brooks night. Again leading off in the second round and with each player receiving five swings, he promptly deposited four balls over the 300 ft. fence, making it very difficult for the rest of the field to duplicate his feat. You can tell when a player is battle tested from previous home run contests. Their competitiveness is easily seen when even after they are mathematically eliminated from winning the contest they are still determined to try for that last home run and put on a show for the fans. This was the case last night as all five gave it their best shot. Joe Povenski made his last home run one to remember, as the fans enjoyed watching one of his patented laser shots hit the top of the lumber yard roof in left-center field faster then a speeding bullet and make that familiar (clang) sound. Or what about Rob Amerson hitting two home runs with his first three swings, then waiting patiently for just the right pitch, hoping to to stay alive, but just missed lifting the ball in the air far enough. He got that same pitch on his final swing and hit a rocket, finishing with three home runs. Oh, how close he had come to sending the contest to a third round. Congratulations to John Brooks, the 2003 Marcus Hook Home Run Champion, who received a trophy, courtesy of Award Connection in Springfield and to all the participants who put on quite a show. All Star Game: It was time to turn on the lights, raise the curtain on what the Daily Times had billed "The Clash of the Titans" being the all-star teams from the Millennium League "A" Division and the Marcus Hook League. The game started with the Marcus Hook League winning the coin toss and deciding they wanted to hit first. After going down 1-2-3, the Millennium League "A" Division All-Stars quickly jumped out to a 10-0 lead in the bottom of the inning and hit four of their allotted six home runs. The game was moving along at a fast pace and into the middle innings when it became obvious that the storm was approaching. It was beginning to look ominous with vivid lightning streaking across the night sky. That�s when umpire Creighton "Doc" Moat said, "If that lightning gets any closer we�re going to have to stop the game." As if by divine intervention, the lightning seemed to stop at the Delaware River and surround the field in every direction. 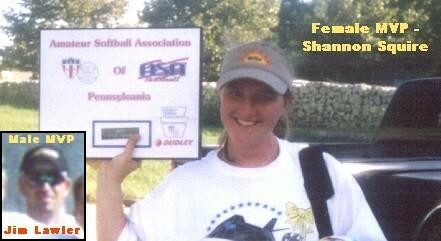 Something wasn�t right, there was a storm going on all around and yet not even a drop of rain fell on Delco�s softball mecca. That�s when Doc said, "It seems like we�re under some kind of dome." Five complete innings had past and the game became official, still no rain. After seven full innings the Millennium League "A" Division was winning by the score of 25-13. There wasn�t a 12 run rule being used in the All-Star Game so the game continued to the eighth inning. The Marcus Hook League All-Stars were determined to start a rally and they did, scoring four runs in the top of the inning to cut the deficient to 25-17. The game was now moving into the bottom of the eighth. I had just finished making one last push through the stands selling raffle tickets for the American Cancer Society, when the skies opened stopping the game with the Millennium League "A" Division coming away with a 25-17 victory in what was a entertaining and well played game. I think even the softball gods were saying to everyone nice job in raising money for a good cause, now it�s time to go grab a beer. Here�s to the managers of both All-Star teams, Bob McLaughin (Millennium "A" Division) and Mike Stern (Marcus Hook League) for a fine job in putting together their rosters and getting everyone into the game. A special thanks to Bob Hornsby (Maggie McGuire�s Pub/bobhornsby.com) The maestro of digitial sports photography, was at it again taking many great shots of the Home Run Contest and All-Star Game along with the party afterwards at the F.O. E. Club. After the game the players and fans traveled across the street to the F.O.E. Club, where one of the best buffets that I have ever seen after any softball event was put out. That along with the price of a $1.50 for a bottle of beer was a sure combination that a good time was going to be had by all. Between the Home Run Contest and raffle a total of $500 was raised from the Millennium/Marcus Hook Leagues for the 20th Anniversary Daily Times/Exelon Champs 'n' Charity Classic in their fundraising goals for the American Cancer Society. Thanks to everyone who made this a successful event. Here�s a list of the winners and their prizes from the raffle, which benefits the American Cancer Society. Scott Olsen � DeMarini Softball Bat, Mike Stern � Autographed Nolan Ryan Baseball Card, Connolly�s Pub � Phila. Phillies vs. Atlanta Braves Tickets � June 18th (Sec. 238 � Row 8), Phil Torrens � $25. Best Buy Gift Card, Jeff Olejniczak � Phillies Sport Plaque from the "Get a Woody Sign Co.", Rich Duranto � 1962 Danny Murtaugh � Topps Baseball Card (PSA �Graded 8), Drexel House Deli � Eagles Sport Plaque from the "Get a Woody Sign Co.", Jim Blickley � Bike Softball Pants with Belt. Thanks to Ed Hopkins from the F.O.E. Club for everthing he provided to have a great party. Next year, the winner of the Home Run Contest will receive a softball bat of his choice and the All-Stars from both leagues will receive Millennium/Marcus Hook League All-Star T-shirts. Brian Sellers (Romansky�s Tavern) was named M.V.P. with 4 hits including a double, two home runs and four RBIs. Adam Dragish (F.O.E. Rage) (HR), Bud Wright (Tom n Jerry�s Outlaws) and Bob Sellers (Romansky�s Tavern) all had three hits. Bob McLaughlin (Tom n Jerry�s Outlaws) had a pinch hit three-run homer. Joe Morris (Tom n Jerry�s/Last Call) was the winning pitcher and had three hits, including a three-run homer. Scott Olsen (Sungate Diner/Moon Plumbing) was named M.V.P. going 4-for-4, with a home run. Phil Torrens (Crest Tavern) went 4-for-4, with two RBIs and scored three runs. Brian Sellers (Romansky�s Tavern) and Scott Olsen (Sungate Diner/Moon Plumbing) both received M.V.P. Trophies, courtesy of Diamond Star Sports. TNT Sports Club of Norristown, PA shocked the senior softball world as they defeated national powerhouse Norelco NY Statesmen of Long Island, NY 20-18 to capture the "B" flight of the National Qualifier competition. Leading the way for the local squad was Sammy Rosen, Jose Castro and Charlie Ferris who all went 5 for 5 in the deciding game. Dale Hood chipped in with a 4 for 5 performance to back the pitching of Rich Collonese. Lou Lussi added a home run for the winners. The defense was led by Lynn Thompson and Dave Nyce. This is quite an accomplishment for Manager Sonny Termine and his TNT squad as they've only been in existence in the senior circuit for a little over three years now. TNT finished up 2-1 in their bracket losing only to another national powerhouse Deluxe Bakery Masters of Cinnaminson, NJ by a 18-6 score. TNT's other win was a 22-10 decision against Monkey Joe's Nig Nut Company of Laurel Springs, NJ. In the "A" flight, Thermco Home Improvements of South Yarmouth, MA defeated the NY Bandits of Long Island, NY to capture that prize. TNT will now travel to Manassas, VA to compete in the ISF World Cup on the weekend of June 21st through 23rd. Tom n Jerry's Outlaws from the Millennium League won the ASA of PA District 6 - Men's Slow Class "D" National & State Qualifier in Marcus Hook. The Outlaws were the only undefeated team (3-0) when play was completed on Saturday and were declared the winners after the heavy rains Sunday morning left the field unplayable. But, by the way they were playing, it wasn't going to be easy for a team to defeat them twice in the championship finals. Now they must decide if they want to compete in the State Finals in York, PA (August 8-10) or travel to Montgomery, Alabama for the Eastern National Championship Final (Sept. 18-21). F.O.E./Delaware Valley Excavating of the Marcus Hook League finished second with a 2-1 record and Manoa Tavern of the Millennium League finished third, coming through the losers bracket with an impressive 4-1 record. Congratulations to Seamus Mulligan's Pub, from the Millennium League, who won the first annual Diamond Star Sports Memorial Weekend Classic by defeating Fizzano Bros. Concrete (IVSL) in the Championship Game 23-18 at Marcus Hook Memorial Field. Seamus Mulligan's new nickname may be the Mudders for the way they played and found a way to win, in what at times were not the most ideal weather conditions, with on and off again showers that made for a soggy field during much of the tournament. Seamus Mulligan's lost their first game 28-14 to Fizzano Bros. Concrete, only to go on to defeat Kelly Monaghan�s Young Guns (Community Mens) in back to back games 24-4 and 21-7, to take them to tournament finals. The Championship Game which was a rematch of their first game and was well played by both teams. D.J. Lauro and Jay Risell, from Seamus Mulligan's, were named Co-MVP's for the tournament and will each receive a Miken windbreaker, courtesy of Diamond Star Sports. A lot of credit should be given to the teams and their managers, Matt Moore (Seamus Mulligan's), Chris Protesto (Fizzano Bros. Concrete) and Larry McFadden (Kelly Monaghan�s Young Guns), who were determined, along with the tournament director and umpire, to get the games played and complete the tournament. NOTE: No more information available on the final standings. The other teams competing were Nationwide Insurance of Spring Run, PA; Pennypacker Insurance/Easton of Lewistown, PA; Hampton Inn of Elizabethtown, PA; and C&L Discount Grocery of Ephrata, PA. Hit n Run of Deer Park, NY didn't make the trip. No info on the Class B and Class D qualifiers, I believe the "B" was cancelled. Mike McGrath and his Dukes Tavern team went through the double elimination tournament undefeated as they beat a tough Pottstown Moose squad 18-3 in the championship game. The Moose lost their first game and battled back through the loser's bracket to reach the finals. Pitcher Mary Ann Curran was named the tournament MVP as she pitched Dukes to victory. Charlie's Pizzeria went through the field undefeated to claim the "C" portion of the Norristown B/C Early Bird Classic. 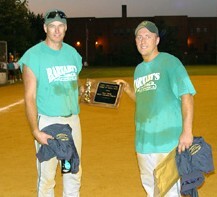 They were led by the right arm of pitcher Ron Rinker who was named tournament MVP. Charlies beat Falcones, Main Street, Rib House and then Chicco's/D&D in the final to claim the title. Chicco's/Down & Dirty finished in second place followed by Bridgeport Rib House in third place and Montgomery Fitness in fourth place. 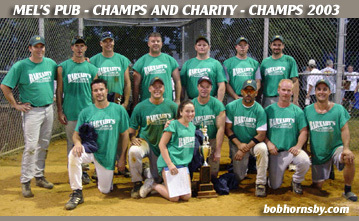 Coors Light of Parsippany, NJ went undefeated to capture its third Millennium Early Bird title in the last four years. Led by left-fielder and power hitting James �JP� Amendolaro (23-33, .697 avg, 9 HRs, 28 RBIs) who was named tournament MVP, the Coors Light squad won eight straight games. They beat Richmond Softball 18-3 & 27-3 and also beat Tom n Jerry's Hitmen 37-5 & 42-0 in bracket play to finish with a +113 run differential which gave them the number one seed in elimination play. After a week delay because of rain, the elimination play saw Coors Light jump all over Parts Plus by a 21-8 score. They then got by Sam's Bar & Grill (Renaissance Marble) 11-4. They got revenge of the team that defeated them last year in Little Brown Jug, as they rolled to a 17-7 victory. Next up was last year's champion, Mel's Pub. Coors light won handily 25-20. In the losers bracket, J&B eliminated Brown Jug 20-8, then came back from six runs behind in the seventh inning to pull out a 27-25 victory over Mel's Pub and eliminated them. They then had to defeat Coors Light twice to claim the crown. Both teams agreed it was getting late and decided to end the affair by splitting the money in an agreed amount by both teams. The leading hitters of the Coors Light team were Paul Carifi (26-35, .743 avg., 25 runs scored, 12 doubles), Mike Stevens (25-35, .714 avg., 27 RBIs, 25 runs scored), Joe Limeira (22-29, .759 avg., 19 RBIs) and Brian Stanton (20-25, .800 avg., 18 runs scored). Matty Moore and his Seamus Mulligan team finally earned a measure of respect in the local area softball circles as they dominated every game they were in to capture the fifth annual Little Brown Jug Early Bird Tournament. Nobody considered them a pre-tourny favorite, but that didn't deter them in their quest to win. They had confidence in themselves and it showed as they waltzed through the competition undefeated. The team, which plays out of both the Millennium Sunday League and the Marcus Hook leagues made some key off-season acquisitions to bolster their already strong lineup. They found an everyday shortstop and clutch hitter in Dave Kwiatkowski (11 for 11 with 2 HRs). They also picked up Norristown native Jay Rissell who just gets hit after hit and you never know he's around until the end of the tournament when you find out he went 16 for 18. Matty Moore, assisted by his brother Frannie Moore calmly turned on the ignition and pitcher Frankie Smith set the wheels in motion and when it was all over they had beaten some of the best teams in Norristown in Cannon Roofing (14-7), Falcone's Sports Caf� (20-0), Mel's Pub (27-7), Humleville Inn (17-7) and Aqua Sun Pools in the final which they won 30-4. Frankie Smith pitched (gave up 25 runs in 5 games) and hit (14-18 with a HR) his way to the MVP award, which was a Miken pullover windbreaker, donated by Joe Organek of Diamond Star Sports. Frankie said he had the fire in his eyse and it showed as he was not to be denied in leading his team tot he title. Other hitting stars for Seamus Mulligan include Jimmy Eckels (17-21, 5 HRs), Rob Amerson (16-19, 2 HRs) and Keith Butcher (12-17). Also contributing were Freddie Smith, Scott Olsen, Danny Coale, Phil Torrence, and Dave Currey. They proved once and for all, that this team belongs in the area's best team list. Congrats to them, they are all good people and deserved to win this event. Matt O'Hara, Craig Balmer, Jeff Neamand and Heath Hedderick got together over the winter and dedicated themselves to making their Aqua Sun Pools team better. What they did was just to add some "Berries" to the mix in the form of Berry Mowing standouts Matt Cordi, Dean Carr, Keith Wood, Anthony Palmeiri, Brent Schaeffer and the ever hustling Dana Luscombe. They finished second in last fall's Tri-County Classic and continued right where they left off as they lost their first game to league nemesis Little Brown Jug by one run, then proceeded to reel off six straight wins. Led by Craig Balmer and Matt O'Hara who combined for 13 home runs, the Pool Men started their way to the finals by defeating Emaus Fire Company 25-6, then they beat Falcones 20-5, up next the Crusaders fell 29-16 and then they defeated Mel's 36-26 (led by Dana Luscomb's clutch grand slam). Pat's Pub was next in line and after the Philly boys led 15-2, it looked bleak for Aqua Sun until the exploded to an amazing come from behind 29-24 victory. Brian Machinsky crushed some long home runs for Pat's. The Aqua Boys then ten-runned Humlevile Inn in the loser's bracket finals 25-15. Humleville was led all weekend long by the hot bat of Jamie Love. Once they got to the finals, they ran out of gas and were beaten soundly by Champion Seamus Mulligan 30-4. Dean Carr had a great weekend at the plate as did Matt Cordi and Dana Luscombe. Big Jeff Neamand pitched and fielded his heart out and proved he is one of the better pitchers in the league today. Jay Williams showed why he may be the second coming of Clarke Farrell. These words were echoed by many a viewer who watched the talented youngster play and take his game to another level that only a few ever visit. Also contributing were Andy Mease, Lou Ercoloni and Steve Cordi. It's good to see some fresh faces emerge in the championship rounds of this tournament like Seamus and Aqua Sun, along with Humleville and Pat's Pub. Pre-tourny favorites like Cannon Roofing, Mel's Pub, Parlaycard.Com, Crusaders and Little Brown Jug never really got untracked. Big Joe Povenski of Mel's unleashed a home run that measured close to 500' with a view finder. I was a witness and it went every bit as far as that thing said it did. I'd like to thank everybody for making this a great tournament once again. The teams and players entered showed nothing but class all weekend long and I appreciate every single person who participated along with the umpires and Sully Gelet who was a big help to the Jug Team in helping to get this tournament off the ground under less than ideal conditions. By the time it was over, the teams were playing at Wierman Field and it looked to be in mid-season shape.